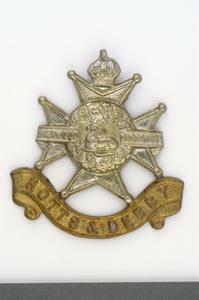 Bi-metal badge in the form of a Maltese cross with ball-tipped ends to the cleft arms surmounted by an Imperial (King's) crown. In the centre of the cross is a wreath of oak leaves and within the wreath a stag is lodged (seated). A half-scroll on the left division of the cross is inscribed 'SHERWOOD' and another on the right side 'FORESTERS'. Below the cross is a third scroll inscribed 'NOTTS & DERBY'. The title scroll is in gilding metal, the remainder in white metal. Cap badge of the Sherwood Foresters (Nottinghamshire and Derbyshire Regiment) of the type which was in use from 1902 (or 1908 in some sources) until 1958. The predecessor Regiment was raised in 1741 as Colonel Daniel Houghton’s Regiment of Foot. In 1751 it was confirmed as 45th Regiment of Foot and in 1781 re-designated 45th (The Nottinghamshire) Regiment of Foot. 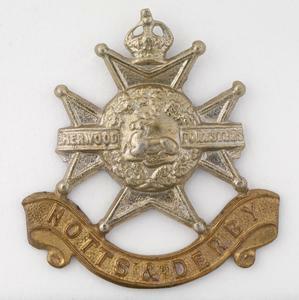 In 1866 it was again re-designated as 45th (Nottinghamshire) (Sherwood Foresters) Regiment of Foot. In the Cardwell / Childers reforms of 1881 the Regiment amalgamated with the 95th Foot (Derbyshire) to become the Derbyshire Regiment (Sherwood Foresters). 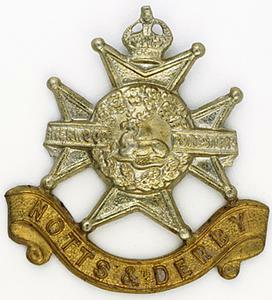 Perhaps because it was most unusual for the junior regiment to be represented in the main title of an amalgamated regiment the name was swiftly reversed, in the same year, to The Sherwood Foresters (Derbyshire Regiment). 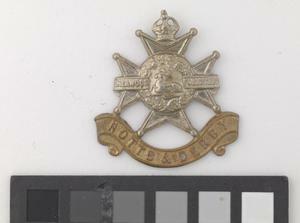 The badge at this time was also unusual in that it took as the dominant element the junior Derbyshire motif of the Maltese cross. The central figure of a stag, lodged (seated), was apparently another motif associated with Derbyshire. As the helmet plate circlet was embossed DERBYSHIRE, that left the supposedly senior Regiment a small straight scroll in the centre to declare SHERWOOD FORESTERS and a crown resting in the top arm of the Maltese cross, although the oak leaf wreath was said to represent Sherwood Forest. In 1898 the cap badge essentially took the central motif of the Maltese cross with stag, central straight scroll and crown, with the addition of a scroll below all bearing DERBYSHIRE. 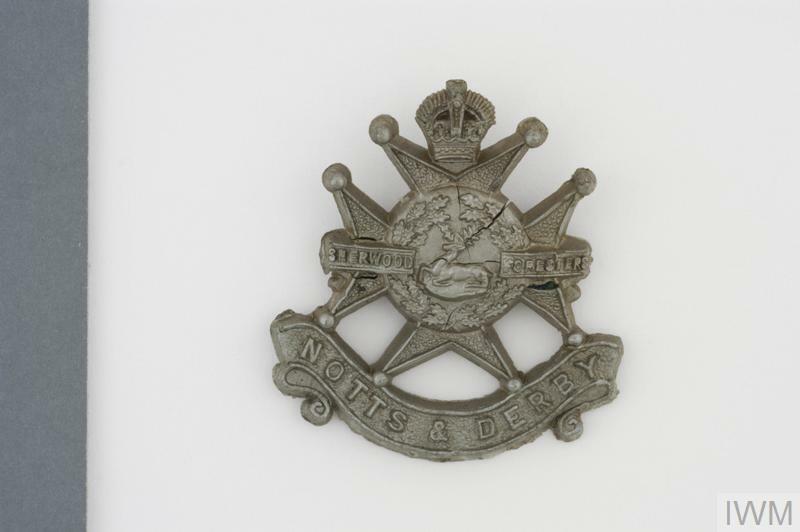 In 1902 the Regiment was re-designated The Sherwood Foresters (Nottinghamshire and Derbyshire) and the badge changed (possibly as late as 1908) to show NOTTS & DERBY on the lower scroll, the crown changing to a King’s crown. In 1958 the Regiment became part of the Foresters Brigade (formerly, if briefly, the Midlands Brigade) until 1963 when the Brigade was broken up and the Regiment transferred to the Mercian Brigade. In 1970 the Regiment merged with the Worcestershire Regiment to form the Worcester and Sherwood Foresters Regiment. In 2007 the Mercian Brigade became the Mercian Regiment, the Worcester and Sherwood Foresters becoming its 2nd Battalion.